The police inquiry into a so-called "honour killing" case is to be investigated by the Independent Police Complaints Commission (IPCC). The body of Banaz Mahmod, 20, was found in a suitcase buried in a Birmingham garden last year. Her father Mahmod Mahmod, and uncle Ari Mahmod, both from Mitcham, south London, were convicted of her murder. Miss Mahmod allegedly told police she feared for her life four times before she disappeared. Mahmod Mahmod, 52, and Ari Mahmod, 51, ordered the murder because they believed she had shamed the family by falling in love with the "wrong" man. Jurors in the trial earlier this month were not told that on 12 December 2005, Banaz sent a letter to the police naming, Omar Hussein, Mohamad Hama and Mohammed Ali as her uncle's henchmen who were going to kill her. 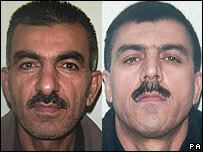 Hama has since pleaded guilty to murder while Mr Hussein and Mr Ali have fled Britain. Weeks after she sent the letter, her father lured her to her grandmother's house and tried to kill her, but she escaped by smashing a window. 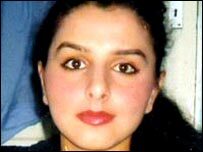 Banaz subsequently disappeared from her south London home in January 2006 and her body was found three months later. Banaz first contacted police on December 4 2005 when she learned of a plot by her uncle to kill her and boyfriend Rahmat Sulemani, whom the family deemed unsuitable. When officers went to her home in Mitcham to investigate, her mother Behya refused to let them in. Banaz returned to her family and pretended she was no longer seeing Rahmat, but they were spotted together in Brixton, south London, on 22 January. The next day her parents went out, and men went to the family home and murdered Banaz. An internal review of the case by Scotland Yard's Directorate of Professional Standards has been handed over to the IPCC after strong public reaction to the case. IPCC Commissioner Nicola Williams said: "I will ensure that our investigation fully examines all contact between her and the Metropolitan Police Service to determine whether anything could or should have been handled differently."